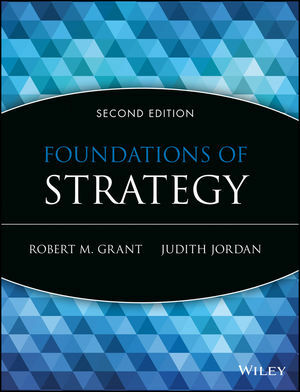 Foundations of Strategy, Second Edition is a concise text aimed at both undergraduate and Masters students. Written in an accessible style with the needs of these students in mind, the second edition of this popular text has a clear, comprehensive approach, underlined by sound theoretical depth. The text has been fully revised and updated to reflect recent developments in the business environment and strategy research. Extensive learning and teaching materials to accompany this text include aninstructor manual, case teaching notes, test bank and PowerPoint slides are available for instructors. Resources for students include self-test quizzes and glossary flashcards to test understanding. ROBERT M. GRANT is Eni Professor of Strategy Management at Bocconi University in Milan and a Visiting Fellow at Georgetown University, Washington and City London University. JUDITH JORDAN is Teaching Associate in Management at the University of Bristol. 10 chapters covering all the topics in a typical one-semester course. Concise and integrated treatment of strategy implementation focusing on strategy in practice. Integration of the not-for-profit sector. Opening and closing chapter case studies covering a range of real-world, global examples. Featured Example and Case Insight boxes throughout chapters to give an additional dimension to the subject matter.